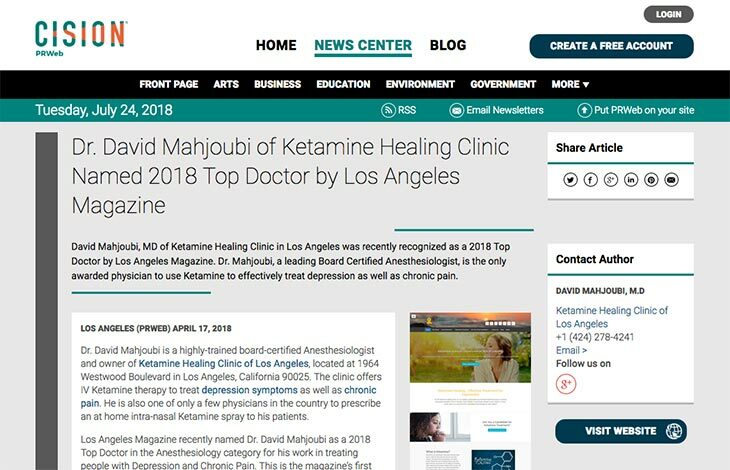 Dr. David Mahjoubi is a highly-trained board-certified Anesthesiologist and owner of Ketamine Healing Clinic of Los Angeles, located at 1964 Westwood Boulevard in Los Angeles, California 90025. The clinic offers IV Ketamine therapy to treat depression symptoms as well as chronic pain. He is also one of only a few physicians in the country to prescribe an at home intra-nasal Ketamine spray to his patients. Los Angeles Magazine recently named Dr. David Mahjoubi as a 2018 Top Doctor in the Anesthesiology category for his work in treating people with Depression and Chronic Pain. This is the magazine’s first year to produce a Top Doctor list. They award physicians who have been chosen through a rigorous review process conducted by PRS (Professional Research Services). This includes a peer-to-peer survey and voting from practicing physicians throughout Los Angeles County. Inclusion into Los Angeles’ Magazine’s Top Doctors cannot be bought, and advertising has no impact on the review process. The special recognition will appear in the April 2018 issue of Los Angeles Magazine. Dr. Mahjoubi’s standout feature is his unique protocol to using Ketamine in treating depression, an approach that has been developed from years of experience and hundreds of patients. Ketamine is a safe anesthetic medication that has been used for over half a century and is a recent breakthrough therapy in depression treatment. Patients follow a unique protocol of 3-5 IV infusions with progressively increasing amounts of Ketamine, a system which has given Dr. Mahjoubi an 85-90% success rate. Patients may also take advantage of a Ketamine intranasal spray to be used at home. The spray is highly convenient and allows patients to continue the positive benefits of Ketamine infusion and even delay subsequent “booster” treatments. Ketamine is very well tolerated by patients, and can be used for those with chronic pain, CRPS, fibromyalgia, and treatment-resistant depression. “I am honored to be chosen as a Los Angeles Top Doctor and be among a group of elite physicians who seek excellence in their respective fields. I hope this recognition allows more people to realize the profound benefits of Ketamine therapy,” says Dr. David Mahjoubi of Ketamine Healing Clinic of Los Angeles.